This video production is widely considered one of the worst in the Brent Walker series. 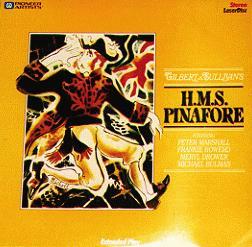 Two of the principals—Peter Marshall as the Captain and Frankie Howerd as Sir Joseph—turn in absolutely hideous performances, while Alexander Faris's leaden conducting robs the score of much of its charm. Some outstanding choreography in the large chorus numbers is not sufficiently redeeming. Americans will recognize Peter Marshall as emcee of television's Hollywood Squares, but he has a Broadway background, and perhaps others will share my surprise that he is actually a strong singer and a capable dancer. 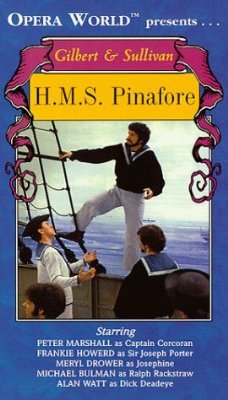 Unfortunately, he turns the Captain into a pantomime caricature, with mugging and overacting that simply don't belong in this opera. If Marshall's interpretation is misjudged, Frankie Howerd's is an all-out embarrassment. He more speaks the music than sings it, and much of his dialogue is ad-libbed, bearing only passing resemblance to Gilbert's. Judging from the resultant confusion of the other characters and the many on-camera fluffs, I am compelled to conclude that Howerd's improvisation is not a deliberate attempt to improve the opera, but rather, that he simply couldn't be bothered to learn his lines. Amidst this mess, there are one or two happy innovations. Sir Joseph never remembers Captain Corcoran's name, calling him such things as Conlan, Coughlan, Coneran, etc. This strikes me as perfectly consistent with the self-important First Lord who thinks a British seaman is any man's equal excepting his. Later, when Josephine encounters Ralph, he is on his knees swabbing the deck. Somehow, Ralph's overinflated prose seems even funnier with the hero holding a scrub brush in his hand. Overall, capable direction is marred by wholly unacceptable casting in two of the lead roles. This was one of the first operas in the Walker series to be taped, and they generally got better as it went along. Take your Rolaids before watching this one. I do not consider this video to be a total disaster. Peter Marshall is quite good as the Captain, even though his performance won't be to all tastes. In fact, I just think him adequate. 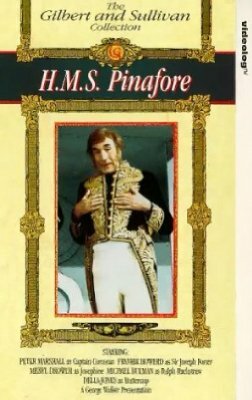 When Frankie Howerd performs Sir Joseph, apart from not singing the music (which I don't mind), he ad-libs his dialogue. The on-camera fluffs actually mean that Howerd has learnt his lines, but he is delivering his dialogue to make Sir Joseph sound like a First Lord with scrambled eggs in his brain. Actually, it's up to the collector to make up his or her) mind. 1999 Roadshow VHS PAL 102023 This is an Australia/New Zealand release. The same publisher also offers a four-video package that includes Cox and Box, Trial by Jury, The Sorcerer, and H.M.S. Pinafore. 2002 Acorn Media DVD AMP-5349 Available only in a 10-disc boxed set (cat. AMP-5483) including the entire Brent Walker series, excepting Trial and Cox and Box.